1. Line a cupcake pan with paper liners and preheat the oven to 150 degrees. 3. In another bowl, stir together sugar, oil, and vanilla extract. Add egg whites and mix well. 4. Add flour mixture alternately with milk, mixing well between each addition. Stir in rainbow jimmies. 5. Spoon cake batter into the prepared cupcake pan and bake for 15-17 minutes, or until slightly brown on top. 6. 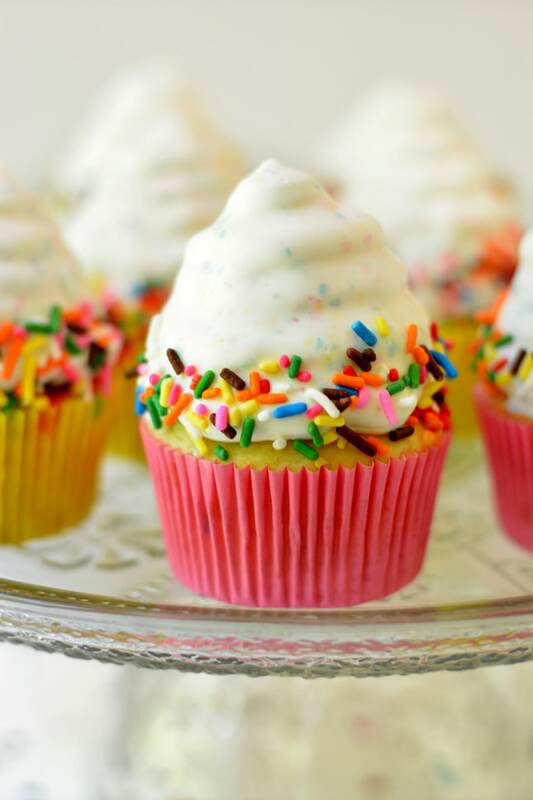 Remove cupcakes from the oven and let them cool completely before frosting. 7. Transfer Cool Whip to a piping bag with a #12 (or similar-sized) tip. Pipe a circle of Cool Whip around the top of the cupcake and use a knife to fill in the circle with more Cool Whip. Repeat this process by piping slightly smaller circles as you move upward. 8. 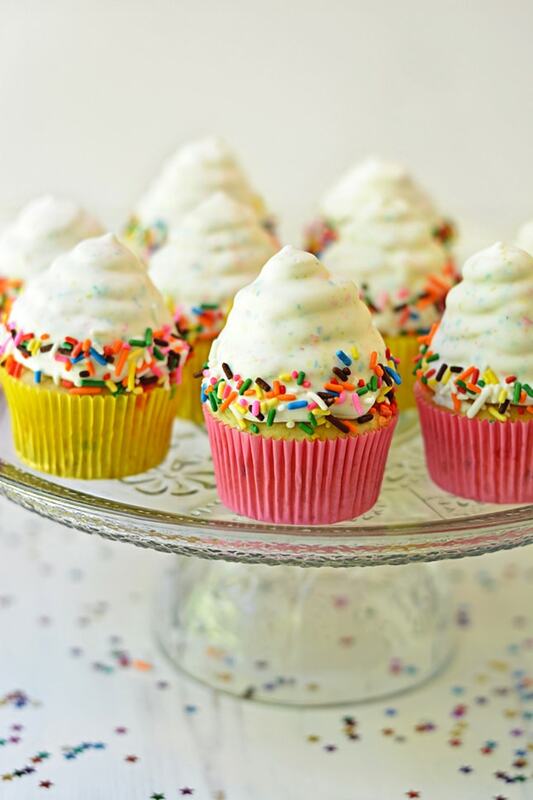 Once you’ve piped Cool Whip on each cupcake, place the cupcakes in the freezer for at least two hours, or overnight. 9. In a microwave safe container, add the Candy Melts and the oil. Microwave on high for 30 seconds, stir, and repeat until melted. Let the candy coating cool for about 5 minutes. 10. Working one at a time, remove a cupcake from the freezer and dip it into the candy coating until all the Cool Whip is submerged. 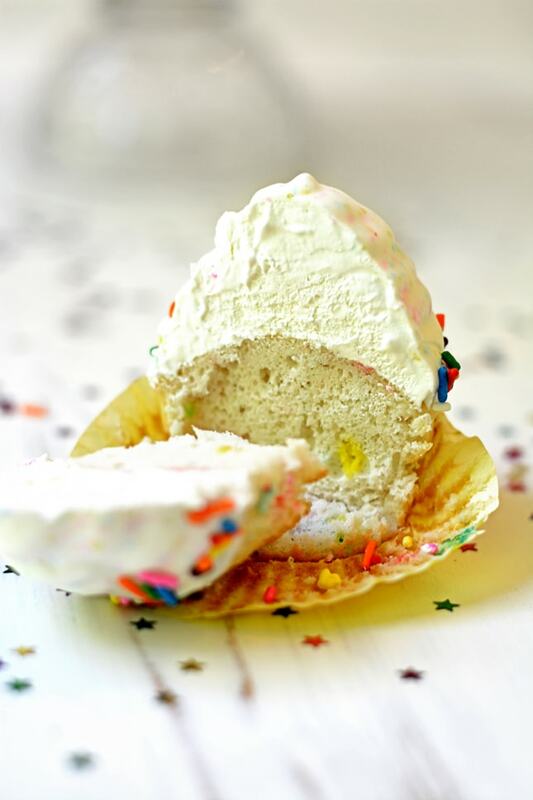 Lift the cupcake out of the coating, gently shake it so the excess coating will drip off. 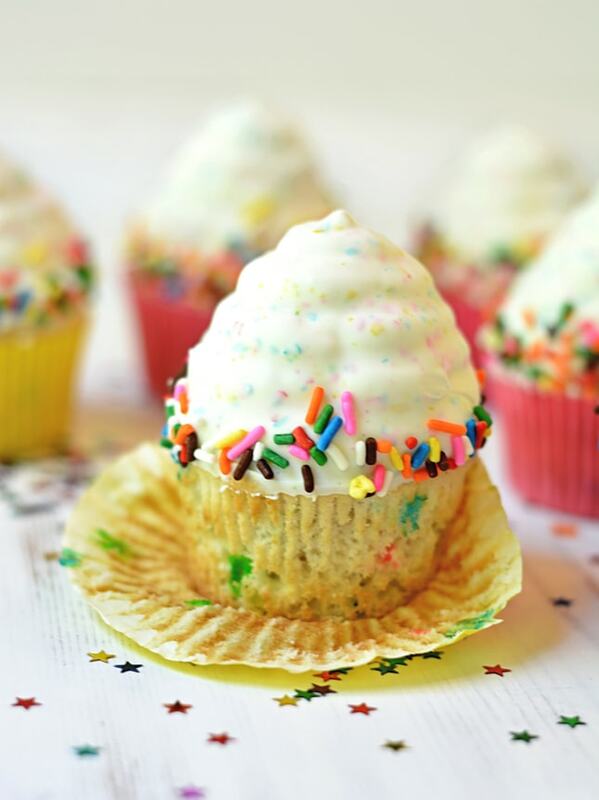 Immediately sprinkle rainbow jimmies around the edges of the cupcake and place the cupcake in the refrigerator.